Be the first to share your favorite memory, photo or story of Juanita "Nita". This memorial page is dedicated for family, friends and future generations to celebrate the life of their loved one. 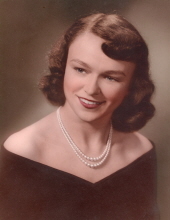 Juanita “Nita” Marcum Smith, of Knoxville, passed away December 8th, 2018. She was born October 5th, 1928, in Wise County, Virginia, to Doyle and Carrie Marcum. Nita was a long time resident of Knoxville, Tennessee, and a proud member of her church community at Cokesbury United Methodist Church for decades. She served as treasurer for her United Methodist Women’s group, The Martha Circle. She lead the Manna House in the Thanksgiving Basket Program, as well as volunteering there often. She was loved deeply by her family and friends, and leaves behind a large legacy of children, grandchildren, and a great grandchild who will miss her greatly. Nita is preceded in death by her husband of 57 years, Sam Smith, Sr., parents Doyle and Carrie Marcum, and brother Earl Marcum. She is survived by her children Bruce Smith, Mark Smith, Sam Smith Jr., and Nancy Smith; grandchildren Mark Smith II, Lynna Smith, Catherine Ensworth, Logan Nichelson, Elizabeth Smith, and Chloe Smith; great-grandchild Adriean; sisters Margaret DeHart and Hilma Collier; brothers Leonard Marcum, James Marcum, Ronnie Marcum, and Harry Marcum. In lieu of flowers, memorials may be made to Manna House, 9919 Kingston Pike, Knoxville, Tennessee 37922. A celebration of life service will be held Sunday December 16th at 2pm in the Old Sanctuary on South Campus at Cokesbury United Methodist. A “Happy Going Home” reception and receiving of friends will follow in The Fellowship Hall. Interment will be in Glencoe Cemetery, Big Stone Gap, Virginia. Click Funeral Home of Farragut will handle the arrangements. To send flowers or a remembrance gift to the family of Juanita "Nita" Marcum Smith, please visit our Tribute Store. "Email Address" would like to share the life celebration of Juanita "Nita" Marcum Smith. Click on the "link" to go to share a favorite memory or leave a condolence message for the family.